Spring in Rocky Mountain National Park is a lot like winter in Rocky Mountain National Park. In fact, oftentimes spring may be more winter like than winter itself. Even when the snow if falling on Rocky there are still subtle signs of warmer weather approaching if you look for them. On this snowy april morning, I headed out to photograph Alberta Falls along the Glacier Creek trailhead. During the summer months this waterfall can be a popular destination. This morning I had Alberta Falls all to myself as the snow fell. During the winter months Alberta Falls and Glacier Creek are covered with ice and snow. In January you would be hard pressed to even notice Alberta Falls as it would be covered in snow and ice. 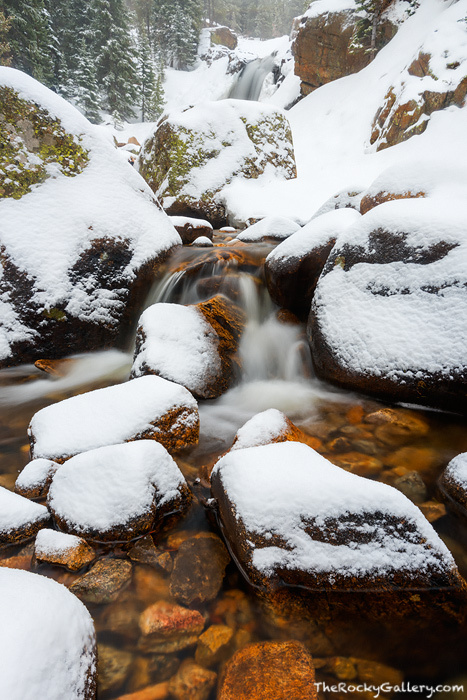 One of the subtle signs of spring in Rocky Mountain National Park is the slow but steady thaw out of the streams and waterfalls in the higher elevations. While the snow was falling Glacier Creek and Alberta Falls had released winters grip and were flowing along, snow and all. Photo © copyright by Thomas Mangan.